Holidaymakers who experience gastric illness whilst on package holidays to Corfu can claim compensation from their tour operator with the assistance of our travel lawyers. Simpson Millar LLP are experts in Corfu hotel illness and holiday compensation claims! Diagnosed with food poisoning on your return from Corfu? Was your holiday ruined by sickness following an illness outbreak? Salmonella, E coli or Campylobacter in Corfu? Ill on holiday in Corfu – Holiday from Hell? 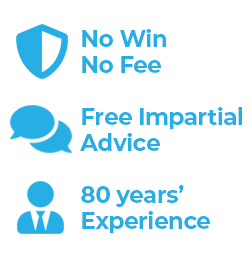 Simpson Millar LLP's Holiday Compensation Lawyers are experts in Corfu illness claims and we can pursue your claim on a no win no fee basis. Corfu Holiday Illness – Holiday from Hell? If you know about a hotel in Corfu where British guests have fallen ill due to food poisoning or because of dirty swimming pool water, please tell us and we will investigate. Holidaymakers who have been diagnosed with food poisoning from Salmonella, Campylobacter, E. Coli or who have ingested a waterborne parasite such as Cryptosporidium whilst on holiday in Corfu are entitled to claim compensation. The Ionian island of Corfu is located just off the west coast of mainland Greece. The island is popular with British tourists during its hot, dry, summer. In winter, Corfu is subjected to rainfall creating a lush, green, island dominated by millions of olive trees. There are hundreds of reasons travellers choose Corfu for their summer holidays. If you leave out its beautiful beaches and popular resorts, we concentrate on just 5! Outstanding natural beauty - the emerald island is said to be the greenest in Greece with olive groves, long sandy bays, and spectacular sunsets. Sightseeing in the old towns – the traditional buildings have wonderful architecture, and Corfu's churches and shops are a tempting diversion from its coastline. Championship golf course – the small island of Corfu has a golf course fit for the most skilled sports men and women. Corfu's Culture – the islanders have a great heritage of music and the arts with many bands giving open air performances in the summer months. Shopping – Corfu Town with its labyrinth of narrow streets is bustling with every type of shop including shops selling the islands famous lace. E. Coli Fact: This 'holiday illness bug' is the abbreviated name of the bacterium in the family Enterbacteriaceae, named Escerishia (Genus) Coli (Species). It is a common cause of Food Poisoning in Corfu. Cryptosporidium Fact: this swimming pool bug is a small protozoa (a one cell parasite). Many Cryptosporidiosis holiday illnesses have been traced to unhygienic and badly filtered and unchlorinated hotel pools. Campylobacter Fact: Stray dogs and cats often pass the Campylobacter bug to holidaymakers, and the infection is highly likely to be carried by the birds feeding on the bread on the buffet! Mareblue Beach Resort Aeolos Beach Resort Cyprotel Almyros Hotel Mitsis Roda Beach Resort Corfu Panorma Resort Mareblue Beach Resort Corfu sea Gardens Mareblue Aeolos Beach Roda Garden Village Aquis Sandy Beach Elea Beach Hotel Mitsis Roda Beach Village. Salmonella Fact: There are several hundred strains of Food Poisoning Salmonella species. Symptoms normally include profuse diarrhoea, stomach cramps which can last for days to several weeks, headaches and fever. Simpson Millar LLP's Holiday Illness Team is renowned for successfully obtaining holiday compensation from tour operators on behalf of frustrated and often angry travellers who have endured illness in Corfu. Our skilled lawyers have worked for most of the major tour operators including: Manos, Direct Holidays, Thomas Cook, Sunset, First Choice Holidays, and Thomson, and we understand how to successfully claim compensation for holidaymakers who are ill on holiday in Corfu. Call us now on 0808 145 1353 or contact one of our travels lawyers by simply completing our holiday illness enquiry form. With offices throughout the UK and associates worldwide you get the reassurance that your claim will be handled by those who have worked in the holiday industry for many years.